After saving people from the Stoneman, Shaktimaan was quite happy. And of course he must, as he did a marvelous job by saving people from one more demon. But is it all good now? What are the events and incidents waiting for Shaktimaan?! Let us take a look. As one important soldier of his army is lost, Kakodar (aka mayor J J) was desperate to get rid of Shaktimaan. He went to Tarendra (one of the old stars of the Galaxy) who is considered as one of the wisest and knowledgeable source. Being a collection of energy and various kind of elements, the star have everything we have in the human body (all the five elements of life Earth, Water, Air, Fire and Space). So theoretically such conversation could have been possible. Anyway, the special effects used in the conversation scene are poor and are not effective. Though, the dialogs are good here. Also note that the dubbing of Nawab Khan (playing J J) seems to be done by other voice artist. However we can say that there are some scenes where he is able to convince audience with his expressions. The story moves ahead with one parallel tale, the entry of a thief Hateli and his companion Shalu. Hateli is a thief he was stopped by Shaktimaan when he was trying to breaking into a flat one night. Shaktimaan hand him over to police and advise him to walk the right path (leave wrongdoings). Hateli was able to outsmart the police constable and ran away. Here J J was hatching a plan to overpower Shaktimaan and he was seriously thinking that the only way to overpower him is to know everything about him including his powers and weaknesses. Very true. In real life also when you need to overpower anyone, you need to take care of these two things. The dialogs are really nice. One more thing we have noticed is the change of the actress playing Geeta Vishwas. Now instead of Kitu Gidwani, this role is played by Vaishnavi Mahant. Not much about the reasons behind the change came out. But we must say Vaishavi is also equally convincing as an actress. 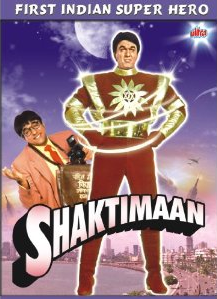 Shaktimaan’s “Shakti-Parikshan” aka test of powers and abilities is the highlight of the episode. It is executed nicely but it looks poor due to special effects used. Nowadays when we are seeing SFX and VFX at very advance level in a lot of movies and TV Shows, and that too in HD quality; it is obvious we start comparing it with the same used in this TV Serial. Be it the technological or economic limitations, but it lacks the quality required. The background music however is able to make the scenes very effective. The scene where Shalu and Hateli robs smartly a wealthy fat businessman is filmed with the intention to provide funny moments in the episode. It doesn’t make you burst into laughter, but it surely bring a smile on your face. Fearful of Shaktimaan’s power Kakodar plays his lethal most weapon, his venom. This poison is very fatal and have the ability kill a lot of people at once. They plan to mix it in the cake to be used in a children’s party, where Shaktimaan is expected guest. Will Shalu be able to inform him on time regarding the party mishap planned by J J and his team? Will Shaktimaan be able to save them? The party scene and the song is good. Again, the makers take the opportunity to spread fun and wisdom together. Remember that this TV serial is primarily intended for the kids, but it is equally enjoyable by elders also. If high-definition video for the same are available for the same, the serial will be more effective. The economic pack is worth the money you spend for it, for sure. And, in order to explore the moral and ethical wisdom, it is a good choice watch such TV serials with entire family. Especially, see it with kids and you will get a chance to make them understand the importance of good qualities. The main positive factor is the moral and ethical things the serial spread. It is definitely worth watching. And, as it is now available as the set of DVD, you shouldn’t miss it.